“Grapes are the most noble and challenging of fruits.” ……. Malcolm Dunn, Head Gardener to the 7th Viscount Powercourt, c 1867. The old saw, “The only constant is change” is probably the only thing that hasn’t changed over the decades. Malbec, originally from France, immediately triggers thoughts today, for example, of Argentina. Whether that’s because of a style preference or because this thin-skinned grape that demands even more heat and sun than Cabernet Sauvignon was devastated (75%) in 1956 by a frost in France, I don’t know. 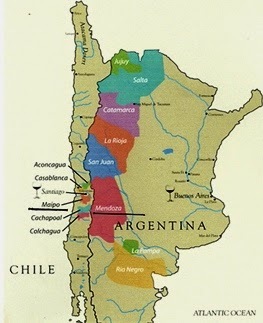 It was planted in Argentina and has since become the country’s claim to wine fame, Mendoza being that country’s Napa. Rutini wines predate all this however. The winery was started by Italian emigrant Filipe Rutini in 1885 (then called La Rural Winery) in the Uco Valley, Mendoza. 1994 saw change continuing as the winery (Rutini) underwent technological renovation under Nicolas Catena and Jose Benegas-Lynch (two major forces in the Argentine wine industry and from one of Mendoza’s oldest and most celebrated wine families) and Mariano DiPaola was appointed winemaker. Today, Rutini has vineyards in five different areas of Mendoza: Maipu, Rivadavia, La Consulta, Altamira and Tupungato (where the grapes for Encuentro are grown). By blending grapes from different vineyards within Tupungato, Rutini is able to take advantage of different vineyard elevations/terroirs in order to create the best expression of the varietal within the bottle. In the glass, Encuentro shows as inky purple. The nose is complex with vanilla-caramel and cocoa powder with clove and violet. I enjoyed hints of cooked fruit, especially plum that carried into the wine’s flavor along with violet, cassis and blackberry. Despite all this going on, I most appreciated the wine’s balance. While plum, blackberry and violet were distinct, they were not overpowering. The fruit was balanced against the wine’s tannic structure and the result was harmony in the glass. Encuentro is creamy on the palette (thanks to its 100% malolactic fermentation) and enjoys a moderate finish that is clean thanks to its fruit/acid balance. 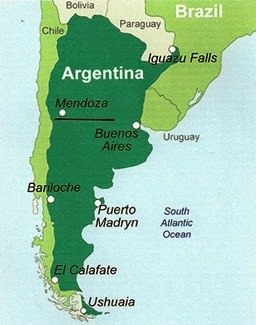 Malbecs from Argentina have been and are, because of terroir, more fruit forward than those of France. And I’ve made no secret over the years that I lean toward old world style wine. But I genuinely appreciated the deft handling of fruit in the graceful manner that Encuentro offered. Another old saw goes like this: “If it grows together, it goes together.” Argentinians are well known for meals rich with grilled meat and sausages. 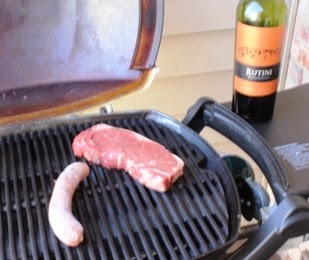 And I can’t imagine a better pairing than Encuentro and grilled spicy sausages and beef, blue cheese and mushrooms. “Encuentro” means “encounter.” With a suggested retail price under $20, this is a wine that’s worth encountering, especially if you’re a fan of Argentinian Malbecs – or would like to encounter what it is about them that make them so popular. Like Wine Mizer on Facebook for mini wine reviews, recipes, fun facts and more. · Bottle provided as sample by publicist.